Ever since the introduction of larger capacity hard drives, activities like dual-booting, partitioning, storing your life on it, and the such have grown much more popular with even the mainstream crowd. With the never-ending growth of size of today's hard drives, and the increased reliance of computers and the data stored in it, there seems to be a need to manage the drives and take care of the data. Backup? Well, make it fast, and make it easy, and make it network-ready. Make it able to be restored on any computer. Add some disk management functions so I can clone my disk to another. Then why do you need Acronis? 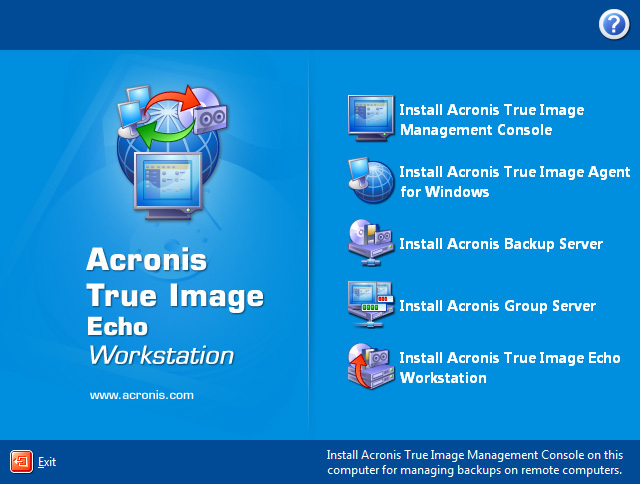 Well, Acronis' True Image Echo Workstation reaches beyond the home and into even workstations around the globe. And besides being just a backup solution, it now manages hard disks and its data to a certain level -- such as disk conversions, streamlining the addition of new drives, disk cloning, advanced networking capabilities in a corporate (Or uber enthusiast) environment. It also promises to deliver a strong portfolio of features, high performance, and ease of use. Deal? Let's see how it goes. The GUI blends in perfectly with Windows XP -- color scheme, buttons and all, which I can understand a huge percentage of users still use. Still, I really would have appreciated a Windows Vista-tailored skin as well for the Vista crowd. That being said, I do continue to appreciate the relative simplicity and familiarity of its layout -- links are on the left hand side, which I expect are the some of the most used or popular features of Acronis. Kind of similar to XP (and Vista). The installation screen offered a collection of five included programs that can be installed, where one of them is mostly what you would use on the workstation itself -- would have been better if each were more clearly labeled. 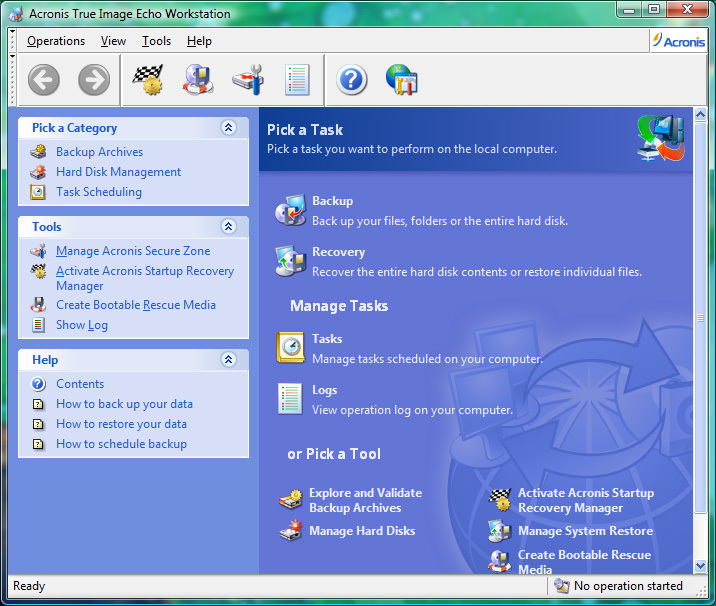 - the True Image Echo Workstation which can create an exact disk image for backup on your desktop or laptop, while simultaneously running other backup jobs on either 32-bit or 64-bit versions of Windows with capabilities for remote centralized management.